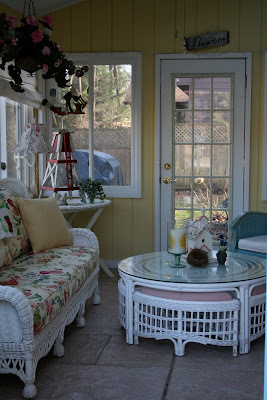 The weather has been so wonderful that I decided to bring my three season porch out of hibernation. It's a bit risky because there are rumors of snow flurries coming next week. I just couldn't stand it any longer and decided to take my chances. Would you like a tour? The porch is a work-in-progress. The floors were put in about a year and a half ago. It was just poured concrete and we had a company come out and resurface it with concrete which has a color in it and then they texture it to look like large ceramic tiles. This cupboard came from a barn sale that I love to frequent. 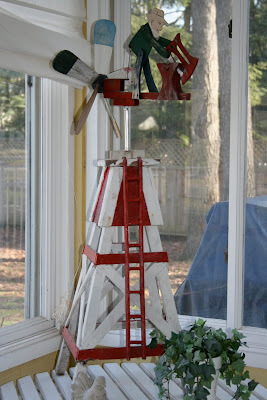 I purchased this wonderfully, whimsical, windmill at my friend, Diane's barn sale. I just love the charm and color it adds to the room. This afghan was one of my most favorite finds purchased at an estate sale. The dear lady that owned this decorated most of her home in roses. I believe we could have been good friends. I enjoy decorating with old doors and screens. I think they add a bit of texture and interest to an otherwise bare wall. Perfect for porch decorating. I keep playing with color out here and love this pretty pale sea foam green chair with the cobalt blue one above. This pillow came from the same estate sale as the afghan. 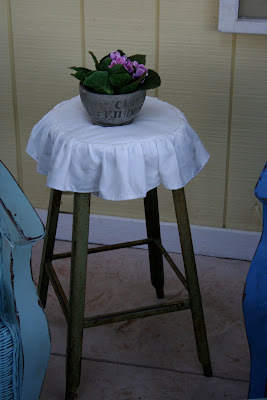 I love that someone took the time to make this iron stool a pretty ruffled seat cover. The perfect spot for my "Cup of Kindness" teacup planter. Pretty pink geraniums add color by the windows. 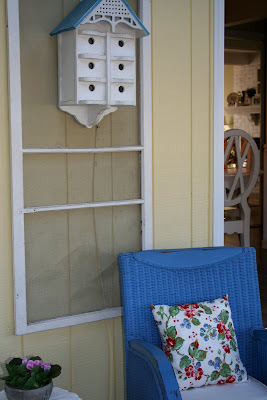 I do use silk flowers in the porch so I'm not trying to water live plants over the wicker sofa. My dear friend, Joyce made the banner for me. I love it on the porch where I can see it every day. She has a beautiful blog and you can visit her here. I get so much enjoyment out of my wicker coffee table. The little wedges come out and you can use them for foot stools or extra seating. Aren't they fun? I recovered them last year with rhubarb colored gingham. Fabric doesn't get much happier than gingham. A sweet little arbor to hold some herbs. A fabulous iron sculpted rose from Joyce in the wine bottle that comes from the restaurant of the first job I ever held at 15 years old. A favorite sign purchased at my friend, Nancy's barn sale. I realize that lilies is spelled wrong, but that just adds to the charm. 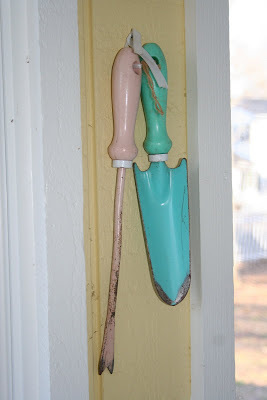 I can get so much joy out of ordinary, everyday objects especially when they are painted in two of my favorite colors. You would have thought I had won the lottery the day I found them, I acted so silly. 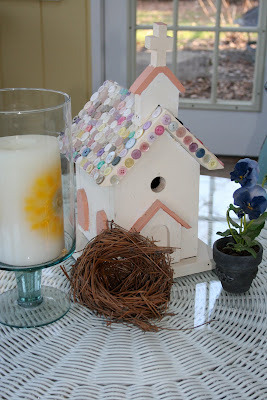 The birdhouse was a fun project. It came unadorned and I, of course, couldn't have that. So buttons it was. Makes me smile every time I look at it. One last sign to show you. It is the back of a chair. The chair was attached for quite some time and sat in my garden, but this is all that remains. The best part really. I hope you enjoyed the tour! Oh my goodnes, Renee. You have the cutest portch. I love all your wicker pieces. That coffee table is so unique. I don't blame you for getting it fluffed and ready to go for spring. Would love to sit and have a glass of tea with you and just enjoy your company and all the pretty surroundings. Come on Spring!! I absolutely LOVE your porch! How inviting. And the coffee table is wonderful! Thanks for the sunshine! I love the colors, roses and gingham. Have a happy spring! 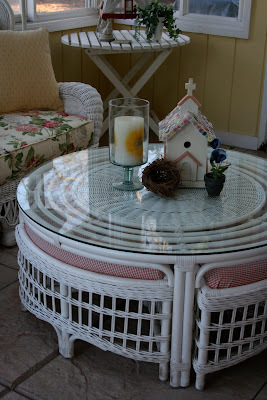 Everything is so gorgeous...you have a wonderful porch...thanks so much for sharing! Ps. You are so blessed to have barn sales!! Just the inspiration I needed! I am working on my front yard & porch this morning. You gave me some great ideas! Its a gorgeous room!! beautiful, beautiful, and all that goes with it!!! I love it and wish I was sitting there right now! Love the banner your friend made and the blue cupboard. Everything is so beautiful and fun. What a wonderful space! I'm hosting a Magnet Swap. If you're interested please stop by. What a wonderful atmosphere on your porch. I enjoyed reading your post. I love your porch. You have done so much with it! What a darling porch! We washed the windows on our porch the other night and enjoyed the rest of the evening sitting out there even though it's still just a bit too chilly. Give me a porch and not a deck any day! I want your 3 season room :) I love it and all you have done to it. It's just darling. guess i will just have to steal the idea! What a cozy and inviting porch...Love it! Wow Renee, i really love all these pictures. Your porch is beyond lovely! So so cozy!! Enjoy all your moments in your gorgeous porch. Oh, my! When can I come over?! I have a book that write/paste inspiring things in (I'm a writer) and I'm definitely printing out several of these photos! Come visit my blog. I'd love to have you as a follower. I just signed up to follow your blog, too!